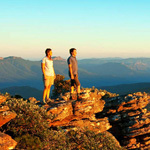 Looking for things to do at Ayers Rock? Located in the Red Centre of the Northern Territory, Australia, Ayers Rock or Uluru is one of the greatest natural attractions and an iconic landmark of Australia. Get a firsthand look at this giant sandstone monolith that towers over the desert landscape of the World Heritage Listed Uluru - Kata Tjuta National Park on a day tour and learn about its history and spiritual impact, see the sun rise or sunset with a breakfast or dinner tour, or even go hot air ballooning in the outback! Book your unforgettable Uluru experience here.